Texans passed a constitutional amendment Tuesday to jump-start financing for water projects in the state: Proposition 6, which would take $2 billion in surplus state money from the state’s Rainy Day Fund to start a water infrastructure loan program. The measure had widespread support from both sides of the aisle as well as business and environmental groups. With over half of precincts reporting, the measure is passing with 75 percent of the vote and has been called by the Associated Press. “I couldn’t be more proud of the members of the legislature who worked in a collaborative way on a very positive agenda for planning for our future water needs,” Speaker of the House Joe Straus, R-San Antonio, said at a rally celebrating the amendment’s passage Tuesday evening. “But the people of Texas today validated our good work with an overwhelming vote of support.” Some Libertarian and smaller environmental groups were vocally against the measure. The creation of the water fund, overseen by the Texas Water Development Board, represents the first time in decades that the state has put significant money towards water infrastructure. The $2 billion approved this week will act like a down-payment on a mortgage that will allow the state to borrow billions more for hundreds of water projects outlined in its official Water Plan. Those projects aim to provide enough water to meet the state’s needs over the next fifty years. “The problem is, we’ve never funded the water plan,” notes Paul Burka, Senior Executive Editor with Texas Monthly, who has spent decades covering the issue. “We’ve had these huge droughts but we haven’t funded it at all.” That is set to change after this week’s vote. “It really underscored how precarious our future is when it comes to water, and how crucial it is that we shift towards a more moderate, water-efficient future,” says Luke Metzger, Director of Environment Texas. Roughly a third of the funding in the programs are set to go towards conservation projects, an aspect of the plan that helped win support from many environmental groups. The Texas Water Development Board has a few years to figure out how projects will be prioritized and approved, and what kinds of projects will fit the “conservation” label. Another lingering concern will be the amount of power in the hands of three gubernatorial appointees, all tied to Rick Perry. 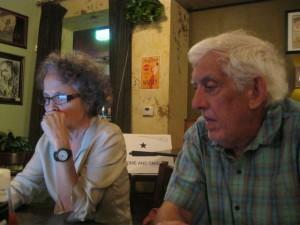 Linda Curtis of Independent Texans and Jerry Locke of the Texas Drought Project watch the election returns roll in Tuesday evening. Both groups opposed the measure. There will be an Advisory Committee charged with oversight of the Water Development Board. That committee will be composed of three appointees by the Lieutenant Governor and the Speaker of the House, as well as a spot for the Comptroller. But how exactly that committee will function — and how much power it will have — is an open question, a matter that will occupy the rulemaking process over the next few years. Groups like Independent Texans were against the measure because of what they call the “cronyism” of the new leadership of the Water Development Board. And as for when the shovels and water-efficient sprinklers come out? That will likely take even longer. The board isn’t set to finalize its process for approving loans until early 2015. Mose Buchele and Michael Marks contributed reporting. 2011 was the driest year in Texas’ recorded history — crops failed, herds were sold off and lakes and reservoirs literally went dry. And in the middle of this catastrophic drought, the state of Texas had one vocal strategy: Pray for rain. Texas Governor Rick Perry issued a proclamation that year asking Texans to pray for rain for three days. Now, a few dry years and billions of dollars in drought losses later, the state government has decided that prayer alone isn’t enough for a thirsty state. And, while Perry admits we can't make it rain, Proposition 6, a state constitutional amendment on the ballot this year, will extend the existing water supply and develop new supplies.